Mother Nature isn't your friend today if you live in the northeastern or mid-wetstern regions of the US. It's ubearably cold, and there are forecasts of snow. You can't miss work because of a little inclement weather, though. 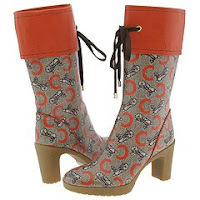 Wave "buh-bye" to the bad weather blahs and slip your feet into a warm, comfy pair of rubber boots. Just make sure they're brightly colored and super stylish, like the 36402 mid-heeled rubber boots from Celine (available and on sale at Zappos.com). The orange accents and classic Celine logo will contrast the snowy, slushy backdrop, and the 3.25 inch heel is low enough to keep your balance, but high enough to let everyone know that cold and snow can't cramp your style. You'll want something toasty to drink tonight, so whether you brave the weather to visit your favorite bar or hang indoors, let Mike Moore's Vanilla B & B warm you up. This drink was concocted by Vancouver's Mike Moore, and the recipe and images are courtesy of City Food Magazine. (Photo by Heather Goldsworthy) The combination of heated Navan Vanilla Cognac and Benedictine will not only knock of today's chills, but it'll also help quiet that slight cough you seem to have developed. LOL @ snow stoppin! I need these for D.C.! I loveee that the drink helps a cough!!! Classic!